Privacy! Quiet! Fun! Eagles. Fishing. Swimming. Boating. Skiing. Tubing. Relaxing. Star Gazing. Family Time. Kayaking, Grilling Out. These are some of the many fun and exciting activities you can do on site. Our Log Home is located 1 mile down a mostly blacktopped road, of which we are surrounded by lots of trees. 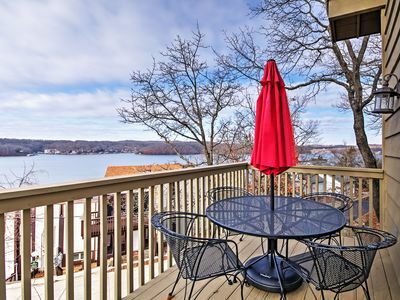 Stay at our beautiful log cabin, that offers a spacious, 6500 sq. 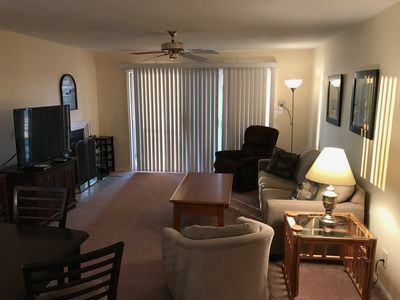 ft, 5 bedroom plus loft. 4 BA, 2 fireplaces and a wood stove. Nestled at the end of a wooded lane on 1+ acre, you will enjoy your privacy and what Mother Nature is offering. 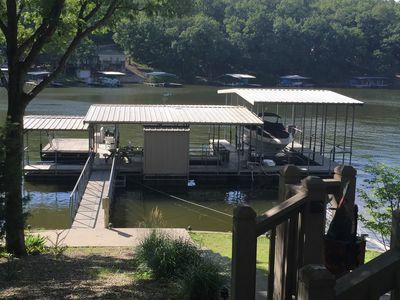 Located near 7MM on the Big Niangua arm with calm water, this home offers the benefits of living on the lake without all the noise and traffic. 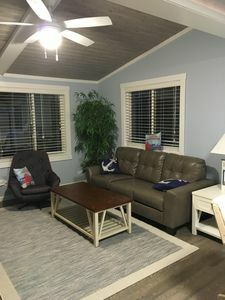 Perfect for spending time with the family for a weekend getaway, a family vacation or even a family reunion, wedding, church retreats; Sleeps 20. 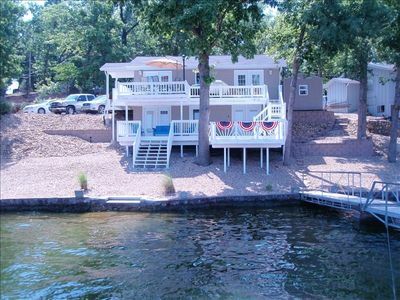 We would love to share our beautiful lakefront log cabin home with you and your family. 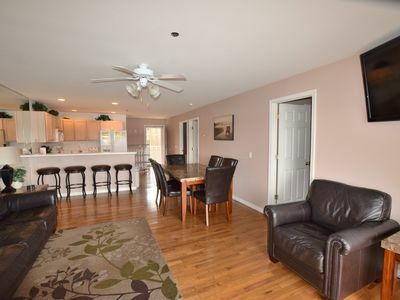 There is lots of space for having fun and entertaining. We look forward to hearing from you. 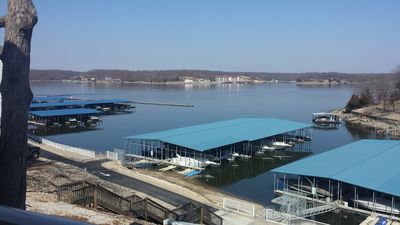 Boat and Jet Ski Rentals nearby. Lots of great restaurants and night life in the area. Great parks, Bridal Cave, Outlet shopping. Master bedroom: ensuite master bath, on main level, queen bed, shower, tub, two single vanities, lake view, with access to deck. Bedroom 2: Main Level, King bed. Bedroom 3: Lower Level, 2 queen beds, with adjoining den, lake view, access to deck. Bedroom 4: Lower Level, 2 queen beds. Bedroom 5: Lower Level, King Bed, lake view, access to deck with spa. Loft: 6 twin beds. Great for the kids. Master bath, shower, tub, two single vanities. Bathroom 2: Main Level. Located next to bedroom 2.Tub only. Bathroom 3: Lower Level, near bedroom 3. Tub/shower. Bathroom 4: Lower Level, near bedroom 4 & 5, Large shower. 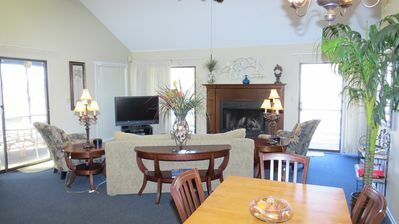 Kitchen: 2 large refrigerators, oven & stove, microwave. Settings for 30+. Small appliances, various utensils & cookware. 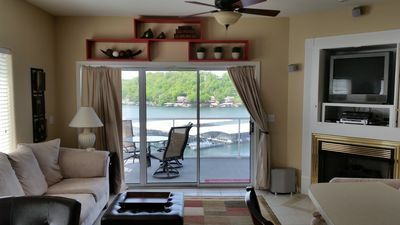 Sun Room: Main Level: Beautiful lake views. 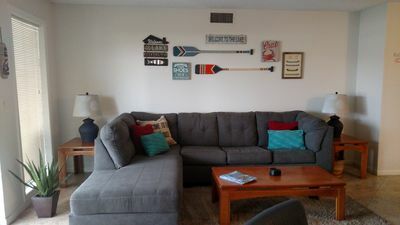 Direct TV for the Great room, Living room, Den, and the Game room. Game Room: Pool Table, Exercise equipment. TV. Sorry no party groups, no smoking, and no pets. WE WILL PERSONALLY CONTACT YOU BY PHONE BEFORE A CONTRACT IS SENT OUT. Minimum age 25, to sign the contract, and must also be staying at our log home. 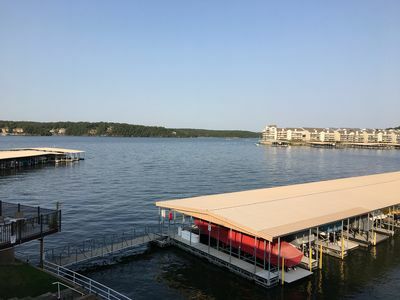 Lakehouse #12 (new listing) site still being updated. 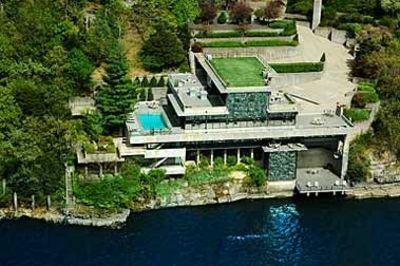 Lakehouse #9 and Lakehouse #10 are right next door to each other. CANCELLATIONS- A ninety (90) day notice is required for cancellation. Cancellations that are made more than ninety (90) days prior to the arrival date, a $200.00 administration fee is charged. 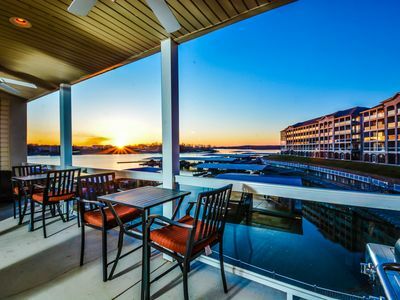 Cancellations or changes that result in a shortened stay, that are made within 60-89 days of the arrival date, will incur a 50% penalty of the total rental rate and taxes. Cancellations within 59 days of arrival date forfeit 100% of total rental rate and taxes. 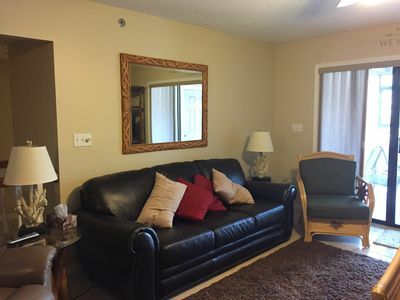 Cleaning fees and security deposit will be refunded. Early departure does not warrant any refund of rent. We do not refund rent or deposits lost due to canceled or shortened stays because of weather. Departures due to inclement weather do not warrant refund of rent or deposit. 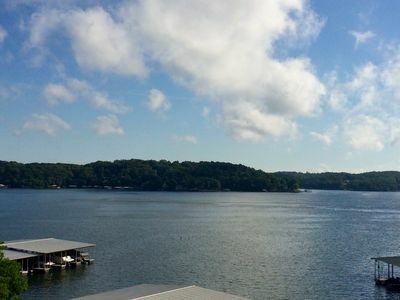 Beautiful Waterfront 3B/2B Lake Condo at Monarch Cove - WiFi/Boat Slip included! 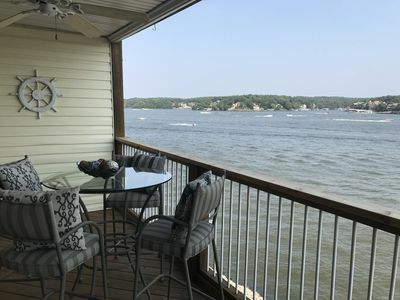 Bagnell Dam Strip Secluded Gem! 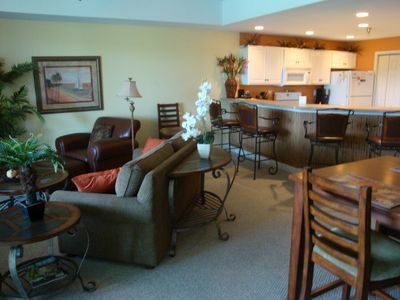 Lands' End 2 Suite Condo - Right by the Outlet Mall! - Close to the Pool! Wi-Fi! 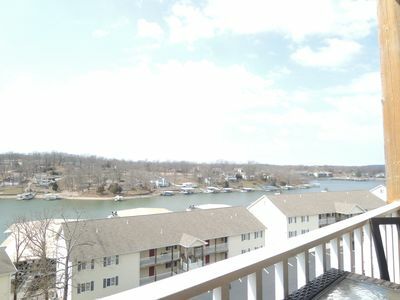 Beautiful Condo, Main Channel View! Sleeps 10! 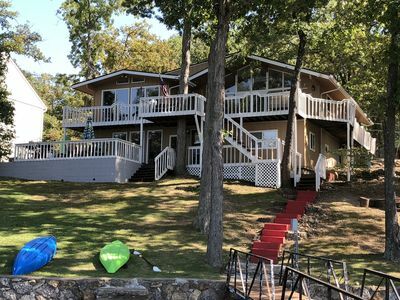 Two Lakeside Bedrooms/Decks! 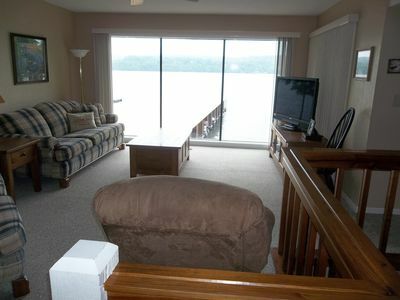 Lakefront 3 bed 2 bath. Swimming pool, hot tub, FREE WIFI close to everything! WOW!! 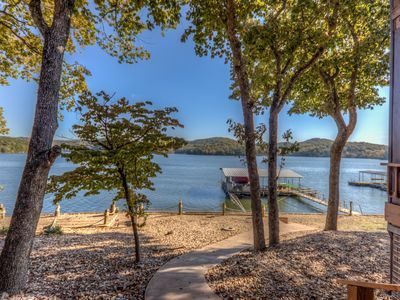 Gorgeous retreat for Family and Friends in quiet Cove - AMAZING! !